The pen knife is a nifty little self-defense item. It looks exactly like any regular pen because it is one and writes like one, yet it conceals a small and very sharp blade. The sharp little knife can serve as a letter opener, box cutter, and cutting small lines. Another great feature of this item is the pen actually works! You can use this in front of people and they won't know its secret. The lightweight pen doesn't get in the way and is small enough to be taken with you on a trip to the store or on your way to work. In no way is it heavy or too large to carry. It's great for self defense, but also comes in handy as a regular writing pen. There is nothing difficult about the operation of this pen knife. It is easy to use as a pen and as a knife. The top is simple to pull off, revealing the blade, but safe enough to carry without accidentally hurting yourself. These letter openers are actual pens that could save your life. They look like an ordinary writing utensil but feature a 2.13-inch blade that is revealed by pulling the two halves apart. The color options are Black, Silver, or Gold. Easily concealed so you can take them with you just about anywhere. No one will think that this expensive looking writing instrument actually contains a blade that can be unsheathed very quickly. Nice looking and writes nice too! Keep one in your shirt pocket and keep one in your binder so you'll always be prepared. Absolutely 5 stars on these. I've bought multiple pens and colors, not only for myself but for prize-drawings at self-defense workshops. Everyone loves these and always asks where I got them. I've given your website out to more people than I can count. We've purchased more of these than we can count! 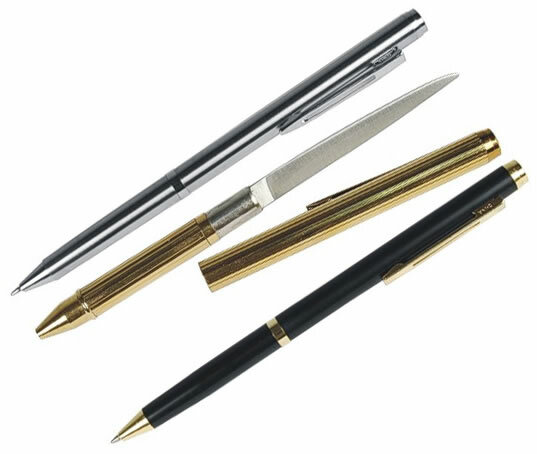 The pens work, ink lasts a long time, and they look very high-end (especially the black/gold). The blade inside is very sharp, but there is no way for anyone to be able to tell it's there. Everyone loves these. 5 stars! 5 stars, the pen knife was not cheaply made, and the quality is good. I've gotten several pens for colleagues and we all like them. One small thing, we can't find refills for them. Ordered four more. Anyone know where to get refills for the pen? I am going to just cut down regular refills otherwise. Yes, I use it as a pen too. Well crafted. Nice sleek design. The clip is attached very well and holds tighter than you could imagine, which is what you want. It'll shave your forearm right out the box. Oh and it writes, also. Good job, guy. Thumbs up. I love it very much! It writes very well and the knife is sharp! 100% would buy it again!! I have seen others but did not like them and they cost a lot more but these here are made good and I do like them. The pen is very nice, looks good and works good. I ordered one for myself and loved it so much, I ordered another in a different color. The pens work really well, and there is absolutely no way to tell what is inside unless you show someone. I carry it to the grocery, in meetings, anywhere I want. The black one looks the most elegant and professional, although the gold and silver are nice, too. I've starting buying these for friends now, because everyone loves the idea.